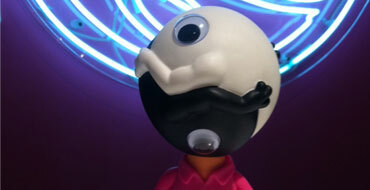 Kidrobot London has a rare and twisted toy for their Store Spotlight today — Big Yang and the Ying Bangers Pink Version by Ron English. This pop culture piece is a deviated Charlie Brown with a Ying-Yang face accompanied by a pair of black and white, Snoopi inspired sidekicks. Big Yang stands 8-inches tall and leashed with chains, the Ying Bangers are 2-inches. Check with KRLDN for current availability. The post KRLDN Store Spotlight – 12/9/11 appeared first on Kidrobot Blog.